When people make a decision that goes against their self-interests, we classify that as a bad decision. We make these types of decisions for many reasons, including simply making mistakes. However, other types of ‘bad decisions’ seem to be more systematic in humans. One such systematic bias can be illustrated by a simple economic game. Imagine a researcher walks into a room with two people. The research gives the first person $100 and the second person $1. How would you feel if you were the second person? You would likely be upset and feel you were being treated unfairly. You might even refuse the dollar because of your strong feelings. This is really quite irrational from an economic perspective. A dollar is more than you had before, so why would you turn down free money? To really understand this bad decision, we need to determine why we evolved to have this bias. To do that, we conduct similar research with our nonhuman primate relatives to see whether or not they share the bias. If they do, then it suggests there was an adaptive reason why we evolved this way. If not, then it may be a quirk of human behavior. It turns out that when we conduct the same experiment above with monkeys (using food, not money), they behave the same way. Some monkeys even throw the lower value food back at the researcher in a clear sign of displeasure. This tendency to compare your outcomes with the outcomes of others and to protest when you get less is called inequity aversion. We think inequity aversion coevolved with cooperation. When we cooperate, we need to monitor what other individuals get to make sure they aren’t cheating. If someone cheats, then you should stop cooperating with them. Thus, we tend to see inequity aversion in cooperative species, like humans and capuchin monkeys. So, the reason we make some bad decisions is that throughout our evolutionary history they were actually good decisions. However, when they are taken out of that evolutionary context and placed in the modern world, they look like bad decisions. Because we are a highly cooperative species, it makes sense to object when we get less than someone else, even if that sometimes means turning down free money. Darby Proctor is an assistant professor of psychology and program coordinator for the animal behavior concentration in undergraduate psychology. She studies nonhuman primate decision-making, focusing on chimpanzees, spider monkeys and lemurs. 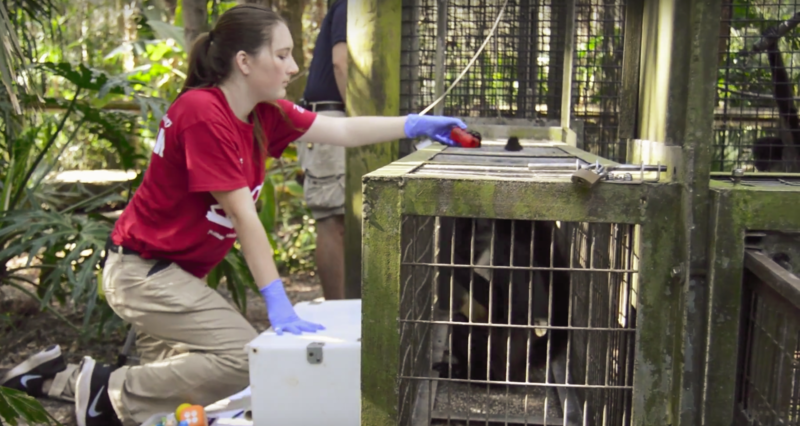 She currently collaborates with Brevard Zoo to study its animals.